A major city in central Kazakhstan which is mostly associated with a) its gulag-related history and b) its coal mining and heavy industry. Both make good reasons for the dark tourist to visit the place. More background info: the name and pronunciation of the name of the place varies a little: "Karaganda" is the Russian name/spelling, while "Karagandy" is a compromise transliteration of the Kazakh name, which is at least as common in the region, and is more accurately represented as "Qaraghandy". 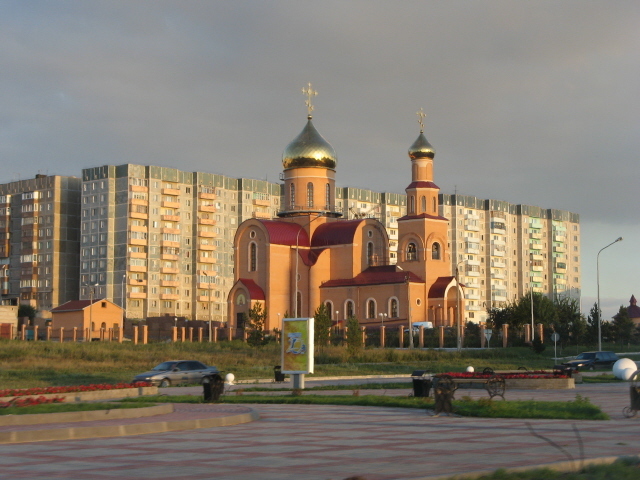 Karaganda was once the second largest city in Kazakhstan, now it has fallen to fourth place, but its population is still significant, at nearly half a million inhabitants. Much of its growth in the 20th century was due to the involuntary influx of ethnic Germans: first during WWII when Stalin had the German minority from the Volga basin exiled to the Karaganda region (as being ethnic German was enough to be considered at least potential "traitors"). Secondly, following WWII, the labour camps of the KarLag gulag system were filled in good part by POWs from Germany. In many cases these had been randomly and largely unjustly accused of being 'werewolves', alleged post-war underground Nazi saboteurs, and initially interned in former concentration camps such as Buchenwald and Sachsenhausen, which were turned into "special camps" by the Soviet occupying power in East Germany, before being deported to gulags in Siberia or Kazakhstan. After the KarLag system was disbanded, many ethnic Germans stayed on in the region. Following the collapse of the Soviet Union, however, Karaganda experienced a massive population drain, when some 100,000 citizens with German roots took up the offer of being allowed to resettle in reunified Germany in the 1990s. Still, there is a strong German-Kazakh link because of these periods of history. The forced labour that camp inmates had to perform was not just connected with coal mining or farming, but even more so with construction. And some of the more prominent buildings in the heart of Karaganda city are effectively the work of the hands of POWs, including, in particular, the grand Miners' Cultural Palace (see below). Karaganda has long been one of the coal mining centres of Kazakhstan and the former Soviet Union. In contrast to the opencast pits near Ekibastuz, though, most mining around Karaganda takes place in underground mines. A good proportion of the coal from these mines is carted straight to the neighbouring steel combine of Temirtau, but it is also used in the power stations that dominate the skyline of the outskirts of Karaganda itself. If gulags and the dark effects of heavy industry and mining are not enough to put Karaganda on the map of dark history, it even has a unique link to the Soviet Union's nuclear test programme (which was otherwise mainly associated with the Semipalatinsk Test Site, the Polygon), namely when in 1962 a high-altitude atmospheric atomic bomb test resulted in the largest ever recorded electromagnetic pulse (EMP). This blew fuses and caused other electrical malfunctions across the region and even started a fire in a Karaganda power station – due to a massive surge in an underground power cable triggered by the pulse. Finally, Karaganda also had less disturbing, more peaceful associations with space, namely in that it was the place where cosmonauts were put up in prestigious accommodation (especially in the Hotel Chaika) and given celebrity treatment after their return from missions and their landings in the steppe around Karaganda. Far less glamorously, there was (and still is) all that space junk that has rained down over the Kazakh steppe, including around Karaganda, from all those launches at the Baikonur Cosmodrome. The Ecomuseum in the city centre has some pieces on display. In the Soviet days, the space junk issue was of course completely hushed up. And even today, it's not much talked about. At least Karaganda was spared the more recent crash of a large payload supply mission for the International Space Station which didn't make it into space and instead came crashing down in the Altai mountains region of southern Siberia, Russia – see under Baikonur for more on this accident. Given all that history as well as its convenient central location, Karaganda is one of the key dark tourism destinations in Kazakhstan. What there is to see: apart from serving as a perfect base for excursions into the environs (see combinations), Karaganda also has few sights of its own that may be of interest to the dark tourist, not least the entertaining and endearing Ecomuseum. Like all larger places in Kazakhstan, Karaganda too obviously has its regional history museum; and certain parts of it may also be of interest to the dark tourist, in particular the sections about WWII and the gulag system of the area (see KarLag), as well as those focusing on the city's connection with mining and the space missions launched from Baikonur. There's also a display about the nuclear tests at the Semipalatinsk Test Site (Polygon). It is supposedly a comparatively good museum (according to the Bradt guidebook to Kazakhstan); unfortunately, though, I did not have the opportunity to check it out first-hand during my short stay in Karaganda, but it may well be worth doing so if you have the time. The museum is located at the intersection of Erubaev Street and Lobody Street and meant to be open daily between 9 a.m. and 6 p.m. (admission 200 KZT). Just opposite the building that houses the Ecomuseum there used to stand one of the last few larger Lenin statues still at a prominent city centre square location. But no more, alas. Much to the dismay of the staff at the Ecomuseum/Nomadic Travel, this shining relic of Soviet glory days has recently been moved – to a typical low-profile suburban location, albeit not an altogether unfitting one, namely behind the Lenin Cinema, on the edge of the city. You will have to ask to be taken there, as it's not easy to find on your own. Other monuments still in their original place include the fantastically OTT double statue of two coal miners proudly holding aloft a mega-chunk of coal of very unlikely dimensions (the real article would probably weigh several hundred kilos and could not be lifted with such glorifying ease even by two champion weightlifters). Still, it is THE landmark symbol of the city. It stands on a wide plaza in the middle of Bukhar Zhirau Avenue by the main access to the Central Park. Opposite, on the other side of the plaza, is the Miners' Cultural Palace, built by POWs/gulag inmates, and featuring a row of statues balancing precariously on the edge of its roof. More monuments of note include the flamboyant Nurken Abdirov Memorial at the bottom of Nurken Abdirov Avenue near the intersection with Bukhar Zhirau Avenue. Abdirov was a WWII pilot who, after his plane had been fatally hit by gunfire, famously kamikaze-ed into German tanks at the battle of Stalingrad (see Volgograd). This sculpture too is quite over the top – depicting the pilot high up on top of a column in a strained posture rather as if he's riding a wild horse or bull, while fiercely staring at a 45 degree angle down towards his target (which is, however, not depicted as part of this monument – but stand in the right spot in front of the monument, and you might get scared …). Like any former Soviet city, Karaganda had to have its general WWII memorial, of course. And the "Great Patriotic War" is still glorifyingly commemorated here not only by means of a gargantuan relief brimming with marble soldiers but also by a still flaming eternal flame, whereas in so many other places these once eternal flames have long since been extinguished and forgotten. 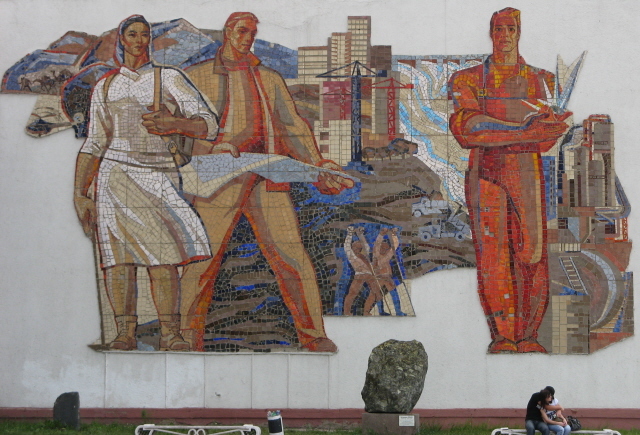 Furthermore, Karaganda still boasts a few superb Soviet era, socialist realist mosaics/murals of huge size. An especially cool set can be found in the city centre in the building complex, one wing of which houses the Ecomuseum, right opposite where the big Lenin used to stand (now pushed out by a new independence monument – see above). 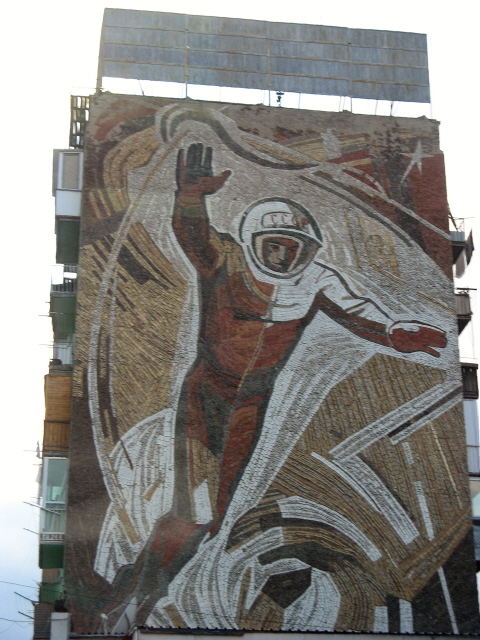 Elsewhere in the city (I think it was on the corner of Nurken Abdirov Avenue and Gogol Street east of the centre) I saw a whole wall mural depicting a Cosmonaut in mid-spacewalk, and still proudly wearing a helmet with the "CCCP" lettering on the front. Speaking of cosmonauts, the Hotel Chaika is of historical importance in that it has frequently been home to scores of cosmonauts after their return landings in the Kazakh steppe, including Valentina Tereshkova, the first woman in space (in 1963). Plaques on the wall of an outbuilding where the cosmonauts resided chronicle the hotel's association with space travel. The central roof structure of the main building is perceived by some as being uncannily reminiscent of a flying saucer itself. Inside the enormously oversized lobby under this roof, on the other hand, the atmosphere is more akin to the empty corridors depicted in Stanley Kubrick's film "The Shining". Karaganda's outskirts quickly give way to a landscape shaped by coal mining – you can see numerous mineshaft towers and spoil heaps … as well as evidence of the pollution-heavy detritus of the associated industries. One mineshaft tower I saw still had a huge Soviet red star on top! You can see some of the coal-mining industrial wasteland sights of Karaganda's outskirts when passing through en route to e.g. Dolinka to see the KarLag memorial museum. Better still, though is an excursion all the way to Temirtau (see below). Location: in the centre of the eastern half of Kazakhstan, in the middle of the vast steppe, about 120 miles (200 km) south-east of Astana. Access and costs: quite easy, not too expensive. Details: to get there it is probably best to use the excellent train connections that Karaganda enjoys, both north to Astana and all the way south to Almaty. The latter two cities are connected by a comfortable fast train called the Tulpar, whose only stop en route is Karaganda. It can indeed save significant time when going overnight to Almaty – but it is also expensive, almost as much as an internal flight (and you have to buy a ticket for the full Astana-Almaty journey, no part distance tariffs are available). Regular trains, in contrast, are cheap. Karaganda's airport has daily connections to Almaty, and even a few international ones, such as two or three a week to Moscow and even weekly flights to Germany (Frankfurt and Hanover). Much more frequent connections for shorter journeys – in the Kazakh sense of "short", that is – are provided by buses, minibuses and taxis. There aren't that many accommodation options but they include the historic Hotel Chaika (see above), which has a pleasant location on the edge of the Central Park, decent large and renovated rooms and isn't too expensive. Eating out options aren't all that plentiful either, but branches of the chains such as Line Brew are OK, as are a few pizzerias and such outlets – I was also steered towards a very decent Korean restaurant by my tour guides. However, I can't remember its name or tell you the exact location (other than that it was a quite a bit outside the city centre, by car) … but if you too chose to go with Nomadic Travel (maybe via the agent Kazakhstan Tours – see their sponsored page here) then you could ask to be taken there too – it's a favourite haunt of their staff. Time required: half a day each for the sights of Karaganda itself and for an excursion to the KarLag memorial at Dolinka and the Spassk memorial should be sufficient. If you also want to add an excursion to Temirtau, you may need to add another half day. Combinations with other dark destinations: the gulag history of the Karaganda region is now heavily commodified at what used to be the centre of the KarLag memorial, Dolinka, Kazakhstan, at a spanking new, impressively large museum in Dolinka village, 25 miles (40 km) south-west of the city. It's a must-do half-day excursion, and indeed the main reason for the dark tourist to come to Karaganda in the first place. It's best combined with a visit to the memorial complex of Spassk. Those dark tourists who are into seeing industrial wastelands up close should definitely make an excursion to Temirtau, just 25 miles (40 km) north of Karaganda. Combinations with non-dark destinations: Karaganda isn't really very touristic itself, but the nature reserve of the mountains of Karkaraly – or Karkaralinsk, to give it its older Russian name, which is still widely in use – is one of the areas that have been dubbed a "Kazakh Switzerland", despite the absence of any peaks of Alpine proportions (see also under Astana). But the pine-covered hills and rocky outcrops certainly provide pretty scenery. The visitor infrastructure, however, mostly consists of Soviet-era, and still very Soviet-style, lakeside sanatoria – though at least one (Tasbulak, where I stayed on an atrocious full-board basis, during a half-day-and-night power cut) ambitiously tries to market itself as a "resort" (yeah, dream on …). Otherwise, Karaganda's main asset in terms of general tourism is that it's located on the main train line between Astana and Almaty (see access).